We've teamed up with Life Unexpected: Adventures of a SAHM to bring you the Merry Little Christmas Cyber Monday Giveaway! To help get your Christmas shopping off to a great start, each participating bloggers has put together a prize package that is valued at $25 or more for you to win. 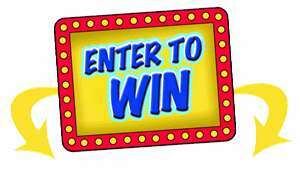 Just hop along the linky to discover great new blogs with amazing prizes! Remember the more you enter the better your chances of winning. But hurry, these giveaways won't last long! 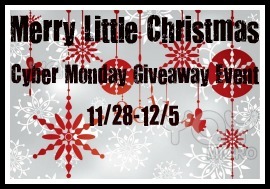 The Merry Little Christmas Cyber Monday hop will end on December 5th! Not sure what I will buy today yet. I will be buying action figures for my kids! i woulddd love to win this. it would help out alot!!! I am buying some Doug and Melissa toys and two collapsible vases and a 2 pairs of jeans from Old Navy! I entered the Chick-Fil-A calendar giveaway. Haven't bought anything yet, but am definitely looking for a good steal! Would love to get some great deals but no money available right now. I haven't bought anything yet! The only thing I'm trying to find is some cheap(er) Jordans for my brother. Nothing. I don't have the money right now to buy much. I was not able to shop this year. Commenting as: Erinn S.....Your email brought me here! I bought some CDs and DVDs on Amazon! I didn't cyber shop today. I actually didn't buy anything this Monday. I bought a Hoover Steam Vac on Cyber Monday. I didn't buy anything, Nov. 28th was the first day home with my newborn, who came earlier than expected, on Thanksgiving day! Bought clothes & video games! A better question is, what DIDN"T I buy on Cyber Monday lol! I purchased most of the kids christmas gifts on that day, and Black friday. Among them were beyblades, my little pony items and board games....just to name a few. I didn't buy anything. Sales weren't worth it. twitter brought me to this giveaway! I didn't buy anything that day, sadly enough! I didn't buy anything on Cyber Monday. I like to do most of my shopping in the store. The only thing I bought Monday were a couple pair of gloves from Kohl's (only $2.40/shipped)!! I didn't buy anything on Cyber Monday! We were really hoping to snag a new TV from Best Buy but they sold out super fast. i bought myself some new boots for christmas and a present for my daughter in florida, i love cybeer shopping! I entered the Glow Crazy Glove giveaway. I didn't buy anything on on Cyber Monday ヅ *Thanks* for the giveaway! I didn't buy anything on Cyber Monday, in fact havent even started shopping yet!! I didn't buy anything on Cyber Monday...I got the last of my holiday shopping done on Black Friday (Actually Thanksgiving night). I also entered the Aveeno giveaway! greer_75023@yahoo.com. Entered the Tonka Road Crew Tool Truck giveaway! I didn't do my shopping on Cyber Monday )or Black Friday). I actually managed to get most of my shopping done before Thanksgiving this year, which was really nice. As I usually am trying to finish my Christmas shopping, in a state of stress up until just a few days before lol. I was working and our IT department had all sorts of sites blocked... so couldn't shop online until I got home, and the best deals were sold out...bah humbug!